I like Michael Keaton, always have. I think he was by far the best Batman, and I have never understood why we don’t see more of him on the screen. 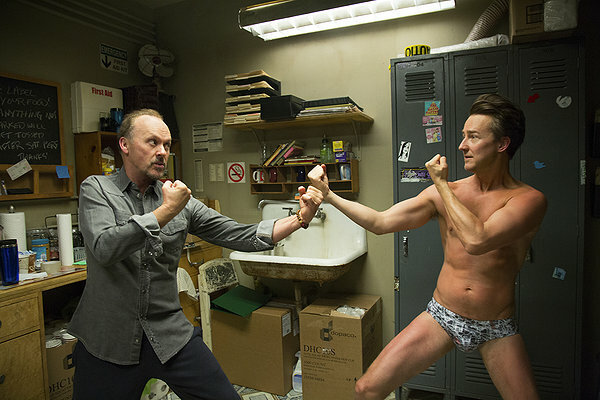 In Birdman, Keaton plays Riggan Thompson, a faded actor who had great popular success as the superhero Birdman, and now cannot escape the role. He is attempting to re-invent himself as an author, director and Broadway director while his world crashes around him. Writer-director Alejandro González Iñárritu is brilliantly inventive, shifting time and place seamlessly, blending reality with unreality without the tiniest of bumps. Even after the movie you aren’t entirely sure what is actual and what is imaginary. Keaton provides a masterful performance as a man tormented by his success. He both loves and hates Birdman, his alter ego, the character who vaulted him to stardom yet keeps him contained in the broad caricature of a superhero. Ed Norton portrays Mike, an actor who barely exists off-stage, who can only be real and himself when he is being someone else. He just doesn’t know what to do with himself when he isn’t acting. Zach Galifinakis does an excellent job as the best friend/attorney/producer trying to hold the entire production together. None of the usual Galifinakis smirks and tricks here, just a solid performance. The ending uses a cheap cinematic trick that debases the plot somewhat but fortunately doesn’t destroy the overall worth of this very good film. I still think you should go see Birdman. I loved this movie! The trick of making the movie appear as one long continuous take was a little distracting but I think it was an important part of setting the tone of Birdman’s state of mind. And I think the reason we don’t see more of Michael Keaton on screen is that he only picks movies he really wants to do and doesn’t feel compelled to stay busy the way other actors do. Nice review! Thanks.